Otisco Lake is situated in the Finger Lakes region of New York State at a mean elevation of 788 feet above sea level. It is 5.4 miles long, ¾ miles wide at its broadest point, and has a surface area of approximately 3.46 square miles. 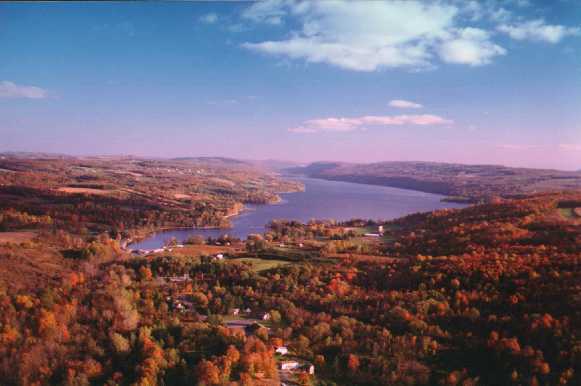 Otisco Lake is the most easterly of the Finger Lakes and the seventh in size of the eleven Finger Lakes. The watershed land area (a watershed is the land area surrounding a waterbody into which all streams and rivers drain) covers nearly 24,000 acres spanning 6 towns in two counties (Cortland and Onondaga). Otisco Lake has five major tributaries: Amber Brook, Van Benthuysen Brook, Rice Brook, Spafford Creek, and Willow Brook. The outlet of the lake is Nine Mile Creek, which flows north to Onondaga Lake.